What an engaging set of songs, and in its somewhat retro way, a brash undertaking. At a time when record sales are dominated by bad rap/hip-hop — crude bellicose karaoke performed by talentless trolls — this Love Story by Matt Munisteri (an “M&M” Eminem with talent, finesse and class) and Brock Mumford is a ninety degree against the grain delight. Love Story evokes the atmosphere of the early twentieth century—Duke Ellington in Harlem—with guitar work that, when it’s not in the Django mode, makes one think of Robbie Robertson of The Band; and an accordion sound that suggests Garth Hudson sighing behind a Dylan song. I’m in fact reminded of The Band here, and their second album, 1969. Back then psychedelia reigned. The Beatles were putting out dense studio crafted stuff like “Strawberry Fields Forever” an “I Am the Walrus; Hendrix was wailing; The Beach Boys went electrical with “Good Vibrations” and “Heros and Villians”; and here came the Band, looking like “country rabbis”, singing about going across the great divide and driving old Dixie down. And now we’ve got a sub-human Eminem ranting about beating on little women and punching gay dudes; and here comes another M&M, Matt Munisteri, with a bunch of talent in tow, sounding like old time song and dance men, doing a whimsical and just slightly naughty “Let’s Do Something Bad”. 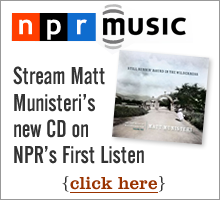 Eight of the songs on the CD are Munisteri originals; the highlights for this listener the slow-sliding “Johnny” and the bouncy “Sidestep”. And throw in Hoagy Carmichaels’ “Lazy Bones”, a hopped-up take on Dylan’s “Don’t Think Twice It’s Alright”, and a marvelous version of Van Dyke Parks (he used to write songs with The Beach Boys’ Brian Wilson) “Orange Crate Art”.